Towards the mid 1100s an important innovation took place in the decoration of Koryo celadons. This was the use of an inlay technique known to Koreans as 'sanggam'. The decoration is carved or incised into the unglazed body and inlaid with white or black slip, before glazing. 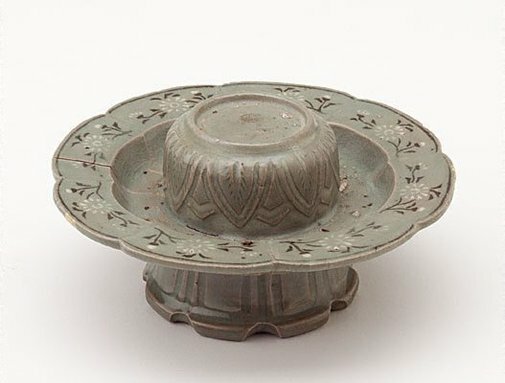 Delicate floral decoration as seen on this cupstand is typical of 'sanggam' designs, which catered to the refined tastes of the Koryo aristocracy. The Asian Collections, AGNSW, 2003, pg.184. The Asian Collections Art Gallery of New South Wales , Sydney, 2003, 184 (colour illus.). Oriental trade ceramics in southeast Asia, 10th to 16th century: selected from Australian collections, including the Art Gallery of South Australia and the Bodor Collection , Melbourne, 1980.